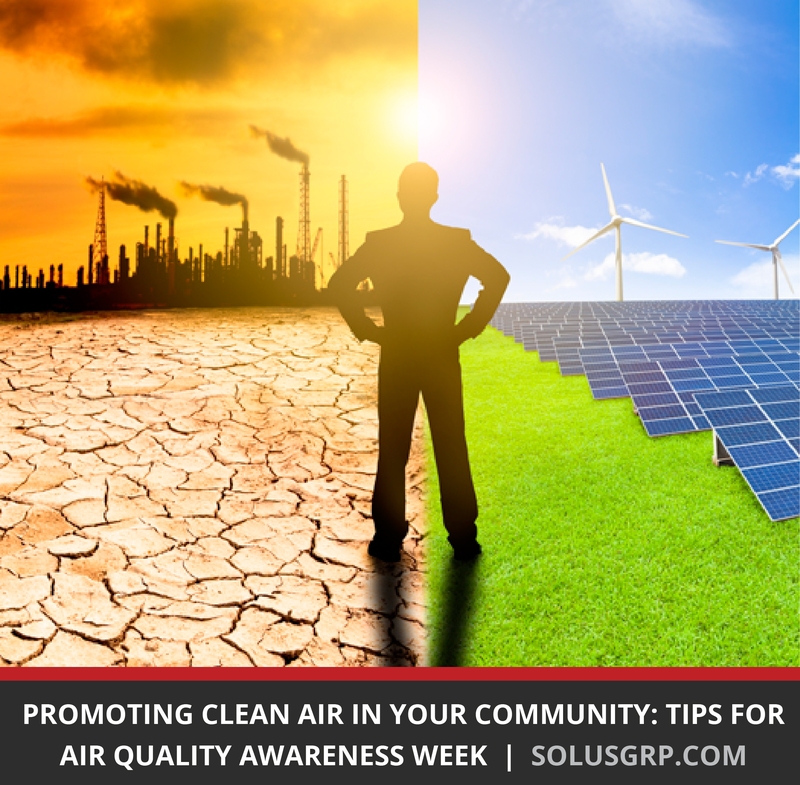 Thankfully, there are plenty of ways that individuals can help reduce air pollution. For Air Quality Awareness Week, let's look at some of these simple steps that make the air we breathe a little cleaner. Get the most out of your car by keeping it well-maintained. A car that is in good, working order will pollute less than a poorly maintained car. Regular tune-ups promote engine efficiency and prolong the life of emission control systems. Keeping your wheels aligned and tires properly inflated will boost gas mileage. And speaking of gas, never top off your gas tank at the pump. This can lead to spilled gas and escaped fumes, which contribute to air pollution. To reduce your car's emissions, never let your engine idle for long periods of time. An idling car produces twice as much pollution as a car in motion. Because of this, experts recommend turning off your car while waiting for periods longer than 10 seconds. Turning off your engine and restarting it causes less pollution than idling and saves gas money. Reduce emissions even more with eco-friendly modes of transportation. There are many advantages to choosing alternatives to cars. Public transportation, biking, and walking all offer great benefits to the commuter and the environment. These modes of transportation are generally cheaper and allow you to discover new parts of your city or town as you take new routes. Biking and walking provide health benefits while reducing congestion on the road and emissions in the air. If you have reading or work to do, try using public transportation as a way to travel without having to watch to the road. Check with your work or school for reduced fares for your local public transportation system. Recycle and compost to divert waste from landfills. Recycling is one of the best ways to save energy. Many materials, like glass and aluminum, can be recycled repeatedly with no loss of quality. Supplying manufacturers with recycled glass and aluminum means that companies don't have to waste energy extracting raw materials from the earth to create them anew. Composting is an ancient eco-friendly practice that's finally coming back into style. By collecting food scraps and yard waste, you can keep organic material out of landfills while producing nutrient-rich soil. Households can collect coffee grounds, fruit peels, and vegetable scraps in a small bucket in the kitchen. Those in communal living situations may need a larger collection container — just be sure to use assistive lifting equipment if you're emptying heavy bins. Composting is important to reducing air pollution because it allows organic waste to break down with the help of oxygen. When those food scraps end up in a landfill, they decompose anaerobically. That process creates methane, a greenhouse gas 25 times more powerful than carbon dioxide. Conserve energy to reduce power plant emissions. One of the biggest causes of air pollution is burning fossil fuels in power plants. Simple changes in your home can reduce the energy you consume which allows power plants to burn less material. Using energy-efficient light bulbs and appliances is a great way to reduce energy consumption with a minimal impact on your lifestyle. Watch for the ENERGY STAR label on appliances — that signifies that the EPA has certified the product as highly efficient. Another way to reduce energy consumption is to buy products made from recycled materials. Recycled paper reduces the need to cut down trees and financially supports the recycling industry (two things that are great for minimizing air pollution). You can find recycled paper products of a similar quality and price to products made from virgin wood. But if consumers don't request recycled products, businesses won't always stock it. Don't forget about indoor air pollution. When you hear the phrase "air pollution," you might picture smoggy cityscapes and smoky power plants. However, most people spend the majority of their day inside, making air quality in our homes, workplaces, and schools just as critical for public health as the air outside. In fact, you may encounter an even wider variety of pollutants in your living room than in your backyard. Here are some common problem areas and how to combat them. This odorless gas causes headaches, nausea, dizziness, and confusion, and it can be deadly in high doses. Gas appliances, fireplaces, charcoal grills, and gas-powered engines all produce carbon monoxide. To avoid exposure to carbon monoxide, make sure to vent appliances and never use your oven or stove to heat your home. Don't run gas-powered engines in confined spaces like basements and garages. Even after you take appropriate precautions, invest in a carbon monoxide detector to keep your family safe. Radon is an odorless gas that forms naturally when uranium decomposes. It enters homes through crevices in basement floors and cracks in foundations. Radon is the second leading cause of lung cancer after smoking and is present in every state in the country (though it's more prevalent in certain areas). Luckily, testing for radon is inexpensive. Do-it-yourself kits are available from the American Lung Association here, and radon mitigation companies also test for dangerous levels. If your house has unsafe radon levels, certified radon professionals can install a fan system to disperse the gas outside your home. These systems typically cost from $800 to $1500 depending on the house. The fibers in carpets and rugs can trap dust mites, cockroach allergens, mold spores, and anything that dirty shoes track onto them. To make matters worse, some new carpets (and the adhesives used to install them) contain volatile organic compounds, like benzene and formaldehyde. These cause problems when babies and small children crawl or play on carpets, becoming exposed to dangerous pollutants. Unfortunately, cleaning carpets is difficult. Vacuuming can actually throw these pollutants into the air, making them even more dangerous. For this reason, experts recommend using a vacuum with a High Efficiency Particulate Air (HEPA) filter. Cleaning rugs outside helps reduce airborne particles in your home, and steam cleaning carpets annually helps reduce pollutants — just be sure to dry carpets properly, so mildew doesn't form under them. These microscopic, insect-like organisms are all around us. And while they don't bite or sting, they still produce allergens that cause major problems for those with allergies and asthma. Because these allergens don't stay airborne for long, they usually settle on bedding and furniture where we encounter them while sleeping. To reduce dust mite allergens, you can take a few precautions. Since they require moist air to live, reducing humidity can drastically reduce the number of dust mites in your house. Removing excess decorative fabrics like curtains, drapes, and pillows gives them fewer places to live. Covering your mattress and pillows and washing bedding weekly keeps their numbers in check as well. Mold and dampness can cause a variety of health issues like coughing, wheezing, and rhinitis. Even worse, dampness makes a house more habitable for cockroaches, bacteria, and dust mites, which can bring even more problems. To prevent excess moisture in your house, keep humidity levels below 50 percent. To achieve this, you may need to use a dehumidifier in areas prone to dampness. Fix all leaks and make sure that appliance drip pans are clean. Thoroughly cleaning and drying these areas will stop mold from growing and keep dust mites and roaches from thriving. The federal government banned lead-based paints just 40 years ago. That means millions of homes still have this potentially dangerous element trapped inside of them. When this paint deteriorates through peeling, chipping, or cracking, lead can become airborne and inhaled. This is particularly dangerous to children whose brains are still developing. You can reduce these risks by keeping paint in as good of shape as possible. Clean up chips and frequently dust around windows, doors, and railings where more wear and tear occur. When hiring contractors for renovations or repairs, always use a lead-safe certified professional to ensure your family's safety. We all want clean air, but it takes a concerted effort to get it. Luckily, there are more options than ever for reducing your carbon footprint and keeping harmful pollutants out of the air. By incorporating positive steps into our lives and supporting industries that help conserve energy, we can help guarantee clean air for future generations. American Lung Association. "Electric Utilities." American Lung Association. 31 Oct. 2017. Accessed 26 Mar. 2018. American Lung Association. "Indoor Air Pollutants and Health." American Lung Association. 7 Dec. 2017. Accessed 26 Mar. 2018. Centers for Disease Control and Prevention. "Facts About Mold and Dampness." Centers for Disease Control and Prevention. 5 Sep. 2014. Accessed 26 Mar. 2018. Centers for Disease Control and Prevention. "Lead." Centers for Disease Control and Prevention. 19 Jun. 2014. Accessed 26 Mar. 2018. "Dust Allergy." American College of Allergy, Asthma, and Immunology. 2014. Accessed 25 Mar. 2018. Environmental Protection Agency. "Composting at Home." Environmental Protection Agency. 20 Mar. 2017. Accessed 26 Mar. 2018. Environmental Protection Agency. "Protect Your Family From Exposures to Lead." Environmental Protection Agency. 30 Aug. 2017. Accessed 26 Mar. 2018. Ohio Environmental Protection Agency. "Reducing Risk from Emissions." Ohio Environmental Protection Agency. Accessed 26 Mar. 2018. World Health Organization. "Ambient (Outdoor) Air Quality and Health." World Health Organization Media Centre. Sep. 2016. Accessed 27 Mar. 2018.